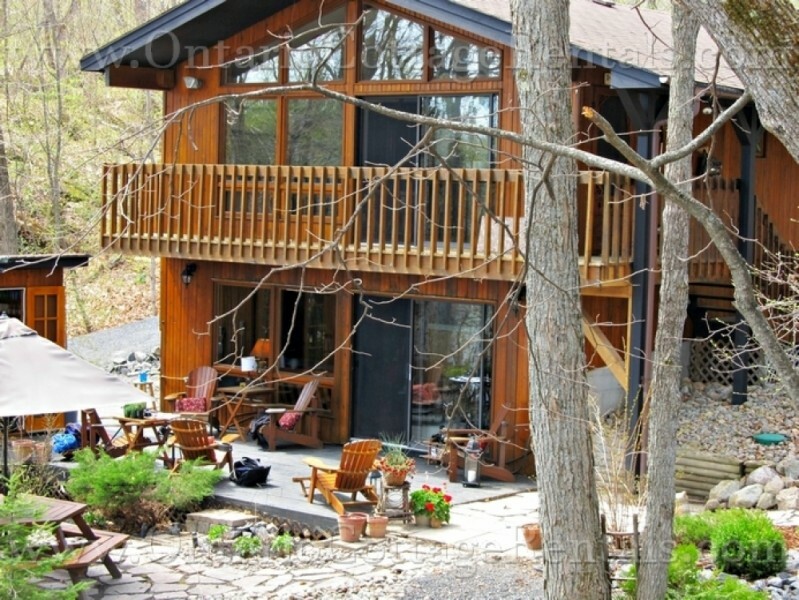 This beautiful cottage has everything you need, including a second outdoors kitchen and a hot tub, to relax with your family and make holiday memories. 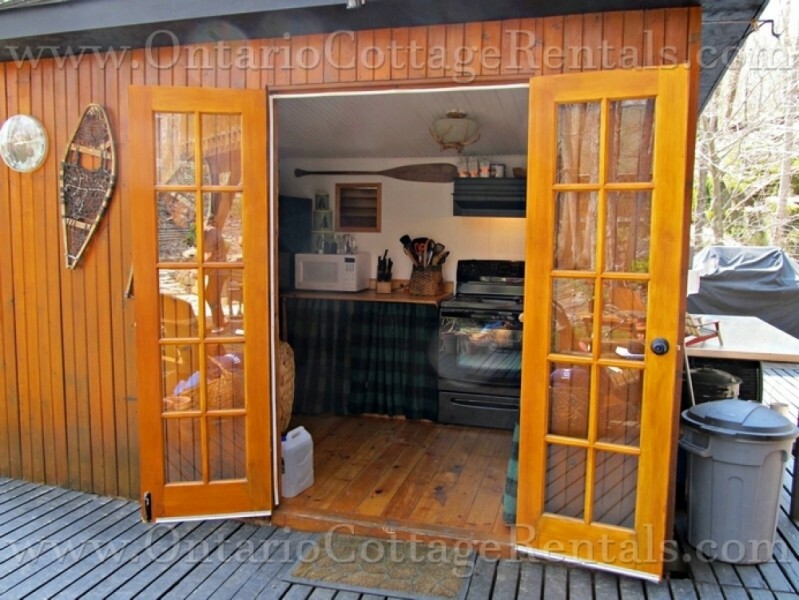 The open concept kitchen and dining area is on the upper level and has the woodsy cottage feel but with all the modern appliances, including a Tassimo coffee maker (bring your own T-disks) and a dishwasher for quick clean up. The butcher block island provides extra counter space for food preparation with pots and pans hanging from the pot rack overhead within easy reach. The dining table will seat 6 - 8 people and the stunning view of the beach and lake will make dinner even more appealing. 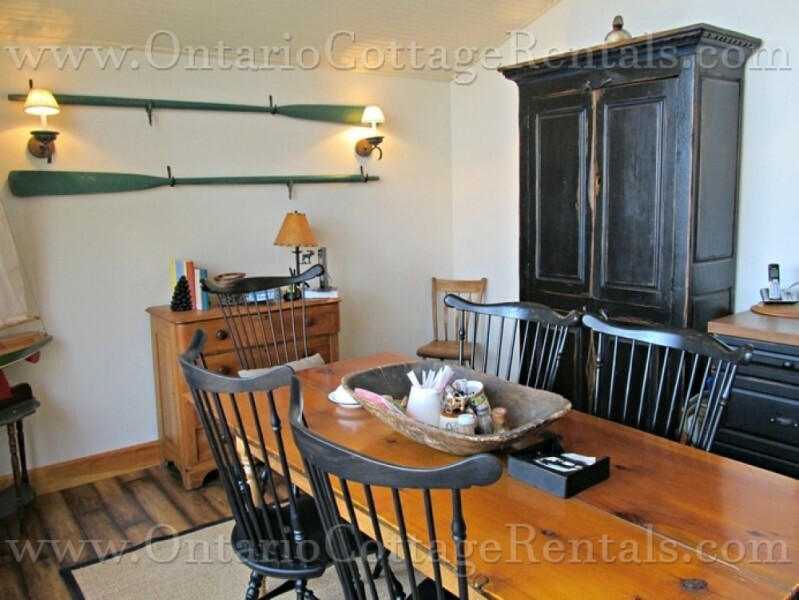 There is also an old fashioned cupboard serving as a pantry in the dining room. 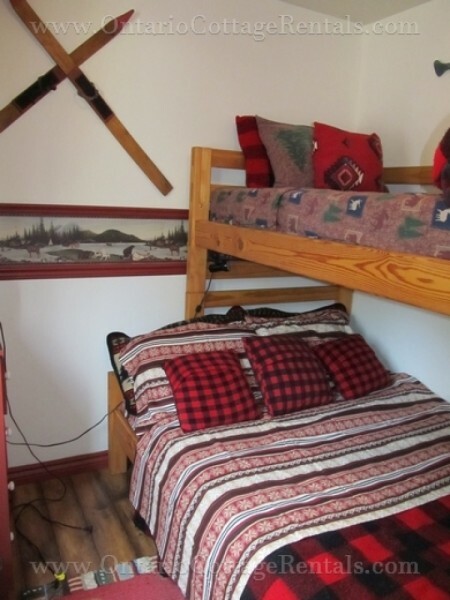 There are two bedrooms on this upper level, the master with a double bed, and one with a set of bunks (queen on bottom, twin on top). 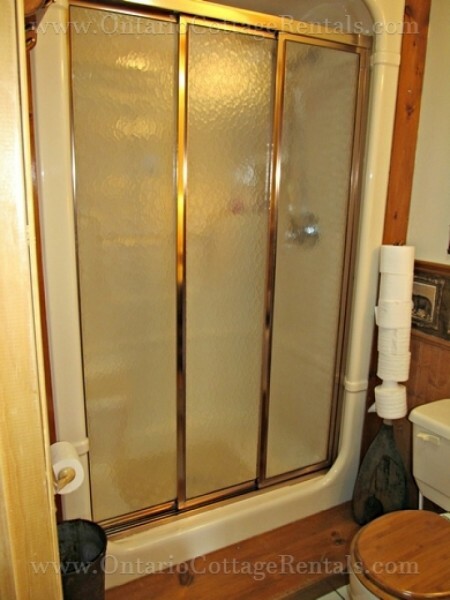 There is also a 2 piece bathroom on this upper level. 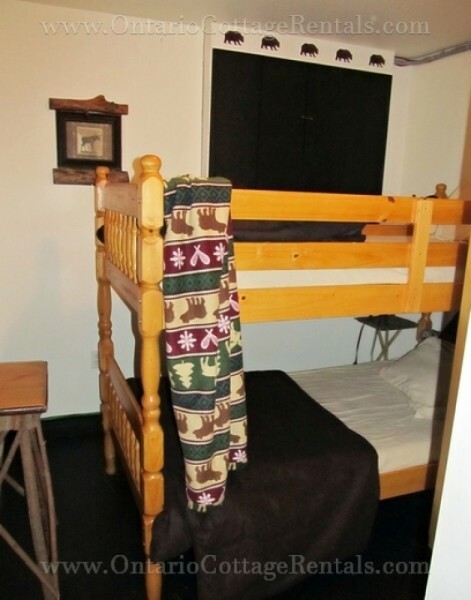 On the lower level there is a third bedroom with a set of twin bunk beds. Downstairs, there is a cozy living room with comfortable seating for 6 to 8 people. 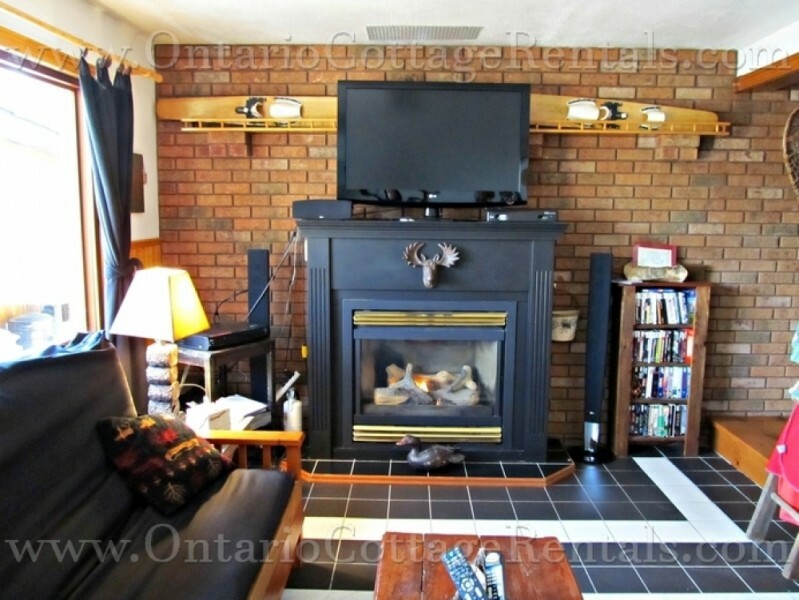 Here you can curl up and watch satellite TV, or one of the over 200 movies on the DVD player. If it is a chilly evening, you can flip a switch to turn on the propane fireplace. 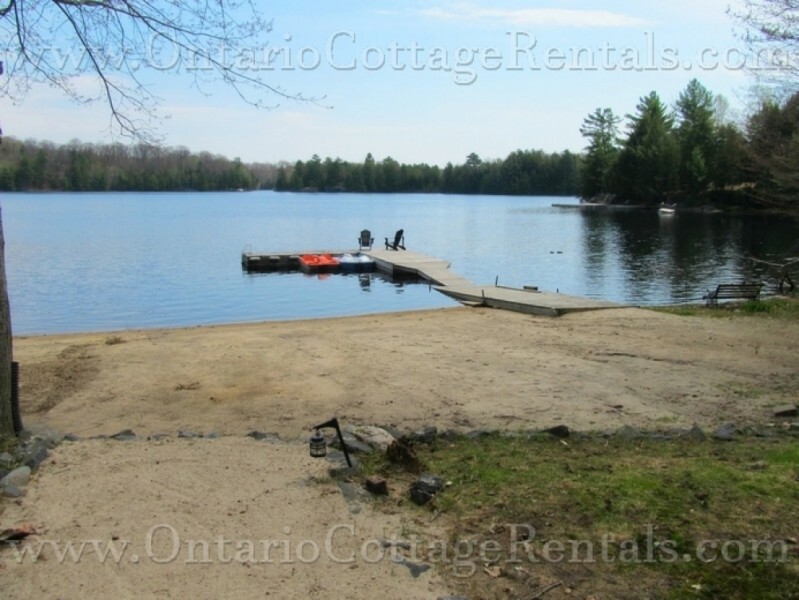 There is no internet at the cottage, but good cell phone coverage which you can use to access the internet on your phone. There is a laundry room on this level. The bathroom on this floor is a 3 piece with a shower. The games closet has hundreds of games and puzzles to keep everyone happy, including a poker table for the older crowd. The sliding patio doors off the living room lead out to the lower patio area with seating for 6, the BBQ, hot tub and outdoor kitchen. There is also an octagonal picnic table &umbrella; with seating for 6 as well. 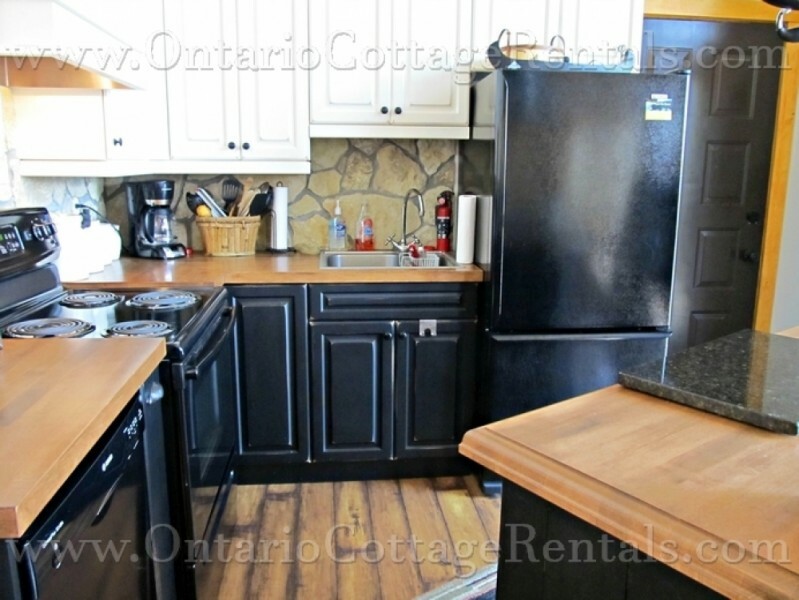 The outdoor kitchen has brand new fridge and stove, microwave, coffee maker, toaster, kettle and dishes and cutlery. There is no sink, but an area outside can be used to hose off your dishes. 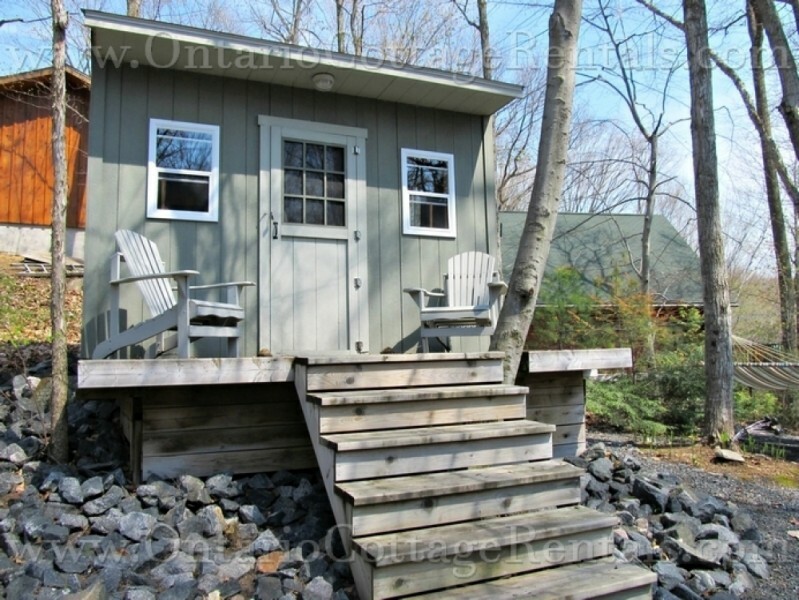 The Bunkie just to the side of the house has double bunk beds, a table and chairs, and a small TV/DVD combination. This is a perfect spot for the older children to camp out. 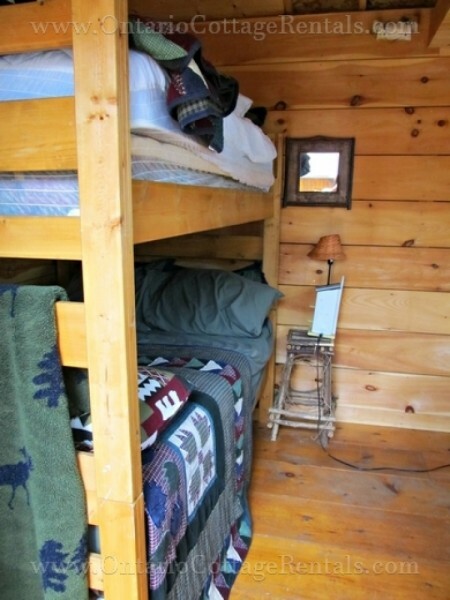 Outside the Bunkie, there is a hammock for relaxing, and a tree house for the younger ones to play in. 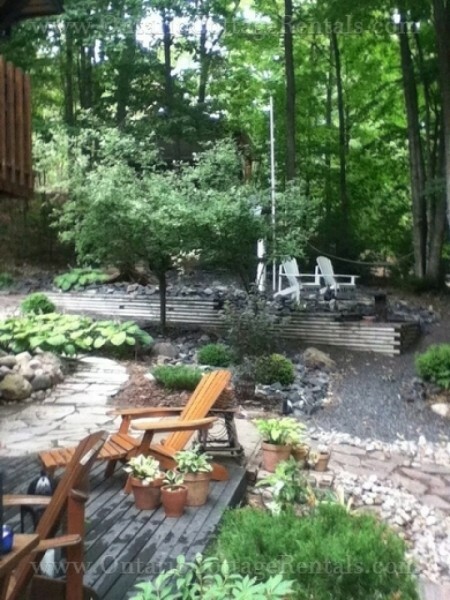 Another seating area is just down the slope near the fire pit area. 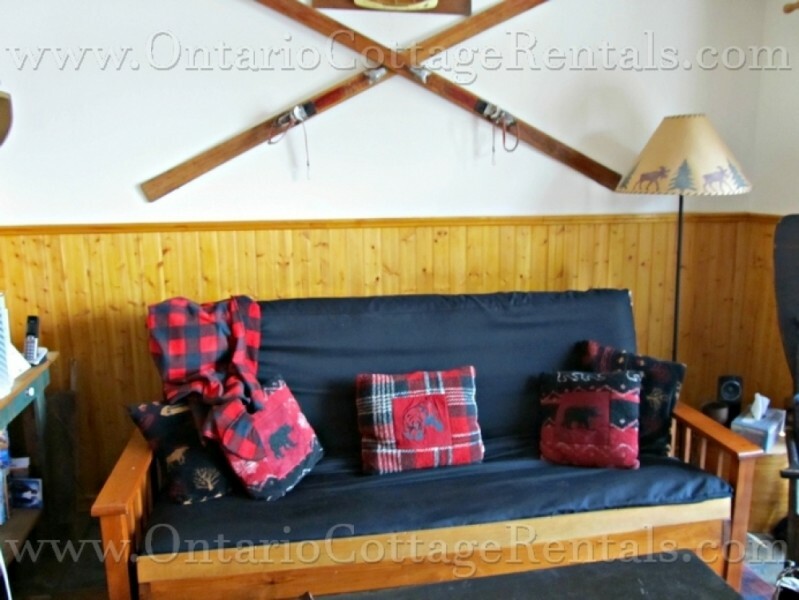 There are two Muskoka chairs on a small platform for relaxing and enjoying the view or keeping a watchful eye on the kids while they enjoy the beautiful beach. There is also a tether ball here for the kids to enjoy playing with, or the whole family can enjoy bocce ball, volley ball, badminton or horseshoes. The fire pit has a couple of benches, and plenty of fire wood is supplied. The whole property has been beautifully landscaped and at night the garden lights go on, to provide subtle lighting on all the paths and throughout the property. The beach is the gem of this property, with 150 feet of frontage and a huge sandy beach with gradual entry. The bottom of the lake is sandy, with no weeds. The L -shaped main dock gets sun all day, and is approximately 50' out and 10' across. There is a swim ladder at the end, and the depth is approximately 5 feet. There is a 2nd smaller dock at the property line. 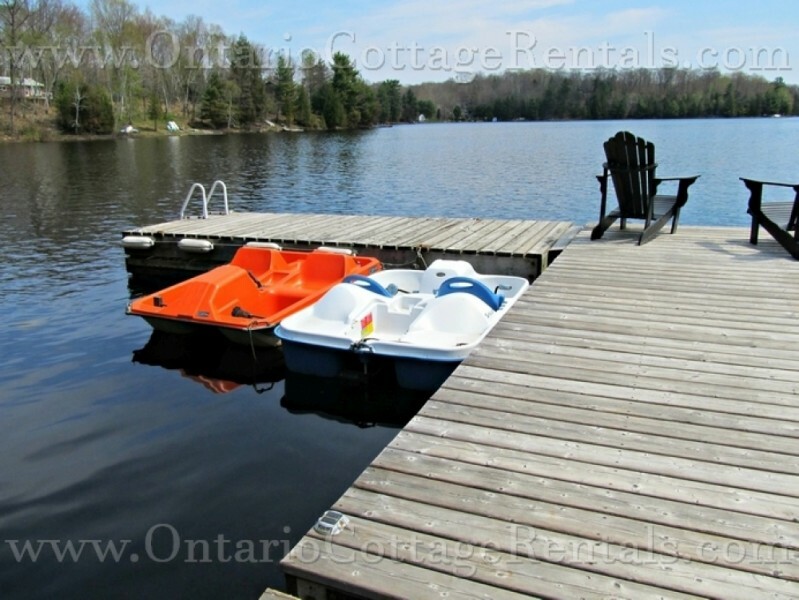 There are 2 paddle boats, 2 canoes, 1 kayak and 1 stand up board are provided. There are also an assortment of life jackets and some safety kits. $1,170 per Holiday Weekend in Off Season - 3 night stay. 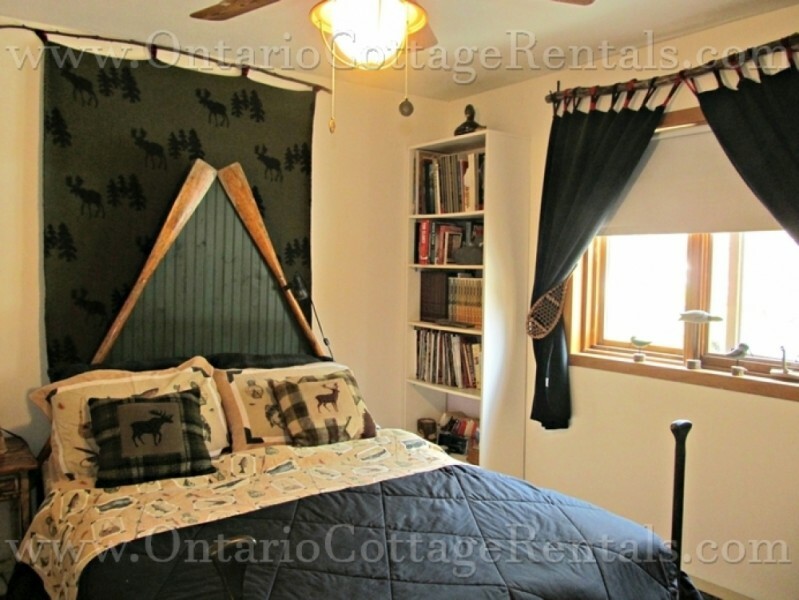 $765 per Regular Weekend in Off Season - 3 night stay. $1,000 refundable security deposit required. High Season includes the last full week of June to Labour Day Monday - one week minimum stay in High Season.